Welcome to a new dimension of personal care. GROHE Sensia Arena stands for Intelligent Care. Behind it are visionary ideas from GROHE, the most modern technology available and the unparalleled ability to combine it all. Enjoy innovative functions that are tailored to your personal needs. More comfortable, hygienic and soothing than using paper, with the GROHE Sensia Arena you can experience a new standard of personal hygiene. The Sensia Arena has two separate shower arms for ultimative hygiene. The lady shower, a spray arm with different spray angle and a softer and wider spray pattern for cleaning the female intimate area. The rear spray, a dedicated shower arm for precise cleaning of the rear area for a perfect powerful cleaning experience. You can be certain that both are perfectly hygienic and positioned perfectly to suit your needs. An innovation which turns the GROHE Sensia Arena into a uniquely immaculate place. GROHE AquaCeramic revolutionises the ceramic surface. This technology forms a film of water, which ensures that practically no impurities are left behind. The result for you: ultimate hygiene – for life. As opposed to normal toilets, the innovative Triple Vortex System from GROHE produces three times the flushing power, which swirls over the complete ceramic surface and cleanses it thoroughly. So thoroughly that after the first flush, there is no remaining residue. Despite its great power, this highly effective flush requires very little water. Cleansing with water at a pleasant temperature. Continuous warm water, for as long as you want. Separate spray nozzles for Lady and Standard jets. Long-lasting toilet hygiene that sets new standards. An especially effective and efficient flush. A toilet free of odours. A toilet that saves your personal user settings. A nightlight which guides you through the bathroom in the dark. Clean and dry without wiping at all. 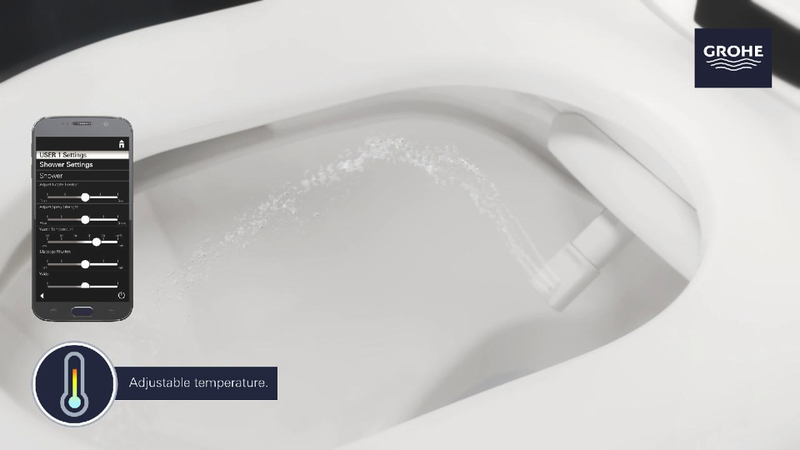 A toilet seat that registers every approach and opens automatically. THE MOST AWARDED GROHE PRODUCTS WITH 14 INTERNATIONAL DESIGN AWARDS. You’d like to find out more?